“2016 will be the year of conversational commerce.” With these very words Chris Messina, Developer Experience Lead at Uber, introduced in 2015 the idea of conversational commerce as the main trend of customer-facing apps. Today, with the chatbot mania in full swing, it is time to review this topic, and see what has happened in the tech world since the pioneering Uber’s first integration into Facebook Messenger. And how this trend is affecting the digital customer experience. Powered by Uber’s API, Messenger has enabled users to sign up for Uber with one tap and request a ride, even if they had not downloaded the Uber app. All important information were delivered to a private conversation between the customer and Uber on Messenger, without having to leave the discussion. The landscape, as we know it, is made of mobile devices that disrupt the way people communicate, share, and connect with each other (and with brands). The spread of the smartphone has brought the entire world into the hands of customers, and for years they have experienced it using mostly mobile browsers and apps. Now, things are slowly – but steadily – changing. The first step in this evolution comes with the huge success of messaging applications. WeChat, Telegram, Facebook Messenger, Kik, Slack come in the form of apps but they are not like all the other apps. They show that it is possible to engage customers in a more meaningful way. In a conversational way. When you look at it from a business perspective, the difference between the traditional and the conversational patterns is evident: in the first one there is interaction but not real-time communication (just think about the push notification); the conversational one, instead, is all about ‘the right moment’. Content and context become so tangled up that you can have one without the other. Some analysts already say that we are moving towards an ecosystem where the conversational commerce could live without the apps, with the improvement of the vocal assistants (i.e. Siri, Cortana, Google Now), or the development of alternative technologies (i.e. Amazon Echo, Google Instant Apps). 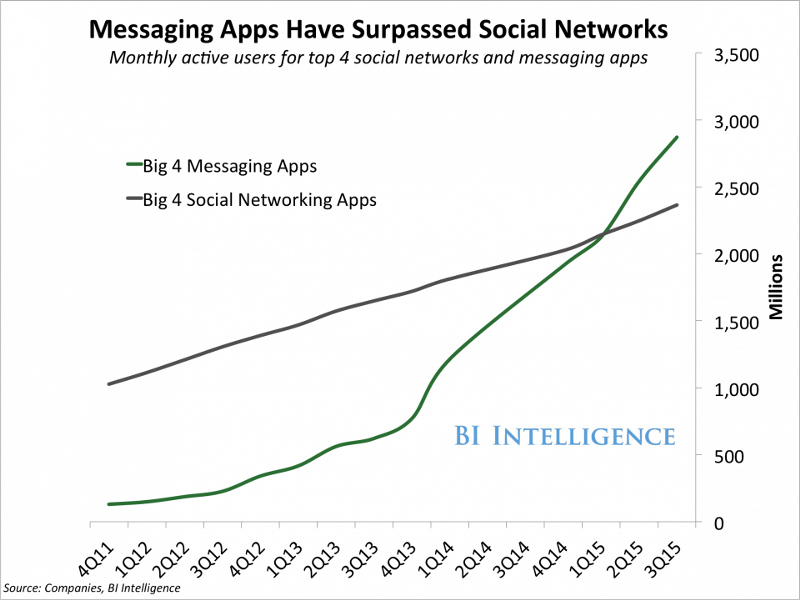 Right now, however, messaging is so huge that it is no wonder more and more brands are willing to join the league. According to eMarketer, 1.4 billion customers used messaging apps in 2015 (31.6% more than 2014), and we will hit 2 billion by 2018. Around 75% of the world’s Internet users use these services, not only chat with friends but also to connect with companies, make a purchase, and get help. We are seeing at work the same forces that have shaped the social commerce trend in the last two years: Brands discover and embrace the business potential of a tool created to entertain. What happened with Facebook is now happening with Facebook Messenger, ultimately unveiling what Mark Zuckerberg predicted at the 2015 F8 Conference: Messenger will become a business platform, in the name of a superior customer experience. That is exactly what we are witnessing today, with the chatbots running all over the place, and bot stores growing within the apps. It is not by chance that Facebook has announced the launch of an API connected to the e-commerce Spring, which will allow users to communicate directly with the service in private chats. Since messaging apps now attract more monthly active users than social networks, it is no surprise that companies see them an ideal vehicle for delivering a better experience, creating deeper customer engagement and retention, and ultimately sell more. The bots (r)evolution is only one piece of the conversational puzzle, and yet bots are attracting attention and investments because their promise is tempting: The automation of services and the creation of more meaningful interactions with customers, at the lowest price. Chatbots, and conversational technologies in general blend human elements, machine learning, and artificial intelligence so that you do not really know whether you are engaging with a human being or a software. Customers could chat with support representatives, ask for product suggestions, compare product alternatives, get personalized recommendations and offers, purchase with a tap, all from within the messaging app. Companies could automate customer service routines, resolve the issues rapidly, engage in real-time, provide order information and delivery notifications, recommend products (up-sell, cross-sell), analyze wishlists to tailor offers. 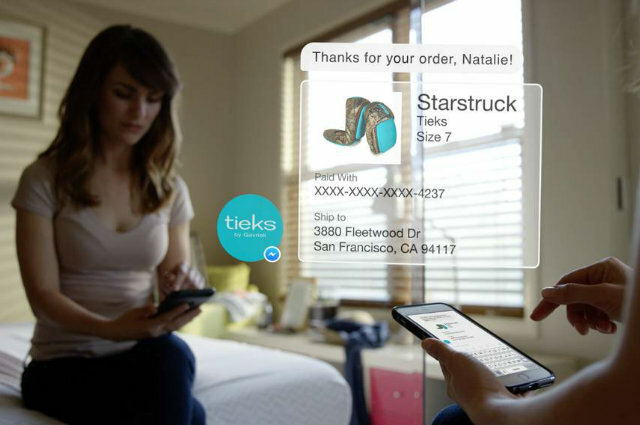 The synergy between the conversational commerce and the mobile messaging has the potential to revolutionize how customers connect with brands. It is a step closer to make the online shopping experience more akin to that in the store. Of course, technology is just a tool, not the purpose. Once again, the main focus should be on creating and delivering an experience that is utterly unique, satisfying and engaging for the customer. Only then the chatbots will be good news for the business and the people.